I have a 1992 Ford Mustang LX hatchback and currently live in England. Road laws here require the use of amber tail lights for the turn signal. Are earlier year models of the foxbody's tailights compatible with mine? Yes. 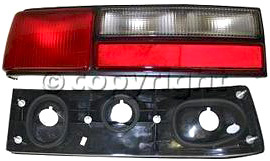 Tail lights assemblies from 1987 through 1993 Mustangs should work. Body style changes before and after that, won't allow it. If you were considering using the originals, the most common and simplest way to add an amber turning light to a 1992 Mustang LX, is to do a little shuffling of the wiring to your stock OEM Mustang tail light. If you remove the light housing fixture from the car, you'll see two sockets for bulbs in the clear section of the tail light. By splitting up the wiring for the stop/turn signal, you can rewire the lights to use one of the clear sockets to act as the turn signal, using an amber bulb for your turn signal light. Mustang Tail Light rather than adding on a non stock looking, but workable turn indicator. The above link, shows both an OEM replacement, as well as some aftermarket housings, for reference. You can use the same technique to adapt earlier Mustang tail lights back to 1987. It may also be possible to use the same technique to rewire an aftermarket Ford Mustang tail light.